Well done to Eoin Riordan (St Gerard’s), winner of the Post-Junior-Cert category at the Irish Schools’ Championships at Emo Court, Co. Laois this week. 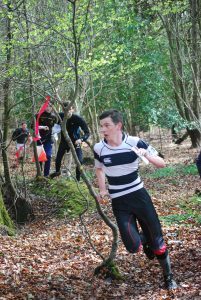 Looking at the Splitsbrowser analysis of the race, Eoin was uncatchable from the start, and finished 72 seconds ahead of second placed Dan McDonnell (Midleton CBS). The Midleton lads, coached by former Olympic Steeplechaser Liam O’Brien, finished 2nd, 3rd and 4th, followed by Dunshaughlin’s Ciaran Kearns, edging out the next 3ROC runner, Aidan McCullough (Belvedere) into 6th. Finn McGrath (Clonkeen) and Ben McDowell (St Michael’s) also ran the same course, while Cuan Riordan (St Gerard’s) finished 4th on the 2nd/3rd Year Boys’ course after misreading control 9 for control 6, an easy mistake to make but one which you don’t make twice! 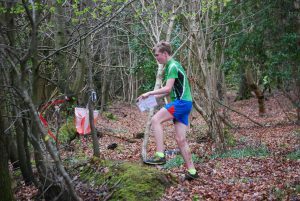 It was a typical April day with sunshine and showers and the flat forest, a former estate like Donadea, proved an excellent choice for the event, with 273 competitors representing 23 schools from as far away as Clonakilty and Dundalk taking part, though none from the North. You can see the full results here. 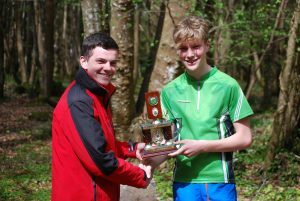 Some consolation for Cuan, however, came in the form of the Leinster Schools’ 2nd/3rd Year Boys’ trophy which he won at the Leinster Schools’ Champs at Djouce last month. Here he is being presented with the trophy by 3ROC club mate Aidan McCullough, last year’s winner. Looking at the list of names on the trophy, both Cuan and Aidan’s older brothers (both called Eoin!) were previous winners. This week also saw the 3ROC AGM, with a presentation on Open Streetmap by Brian Hollinshead as a warm-up. OSM is a world-wide mapping project of volunteers who work together to produce maps with a great level of detail of historical, social and infrastructural information, and Brian has been involved in it for many years. His enthusiasm and knowledge sparked a great interest among some of the attendance. The AGM proper went as AGMs tend to, with little controversy but some good ideas from the floor, and the same committee were re-elected for the next year: Ger Butler, Lindie Naughton, Nadya Dunne, Emma McAuley (Treasurer) and John McCullough (Hon. Manager). The AGM ended with the presentation of certificates and cheques amounting to almost €1000 to the club members who represented Ireland at international level last year: Eoin McCullough (World Championships), Colm Moran (Senior Home International), Clodagh Moran (European Youth Championships, Junior Home International, Senior Home International), Aidan McCullough (European Youth Championships and Junior Home International) , John McCullough (Veteran Home International), Eoin Riordan (Junior Home International) and Cuan Riordan (Junior Home International). Well done everyone! 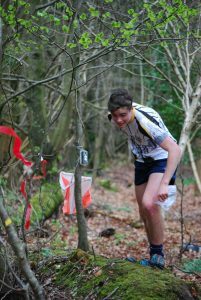 This week’s Leinster orienteering revolves around Setanta’s league event at Glendasan, at the Wicklow Gap on Sunday. This is an exposed mountain area with rough going underfoot, so it’s not suitable for buggies. Courses are relatively short but with quite a lot of climb, reflecting the lack of paths and tracks, indeed a scarcity of linear features of any kind! Details here. Here is an Open Streetmap map showing the event location. See all the weekend fixtures here. 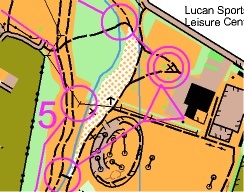 Note that the NWOC Sprint event at Gransha Park in Derry on Saturday has had to be cancelled. Coming up next – Next weekend (May 4-7) the Irish Championships in Sligo and Donegal. If you haven’t already entered, you’re too late! The the Shamrock O-Ringen in Cork and Kerry a month later; the Wicklow Way Relay on May 19th; the UCDO/DUO Senior Squad fundraiser in Cabinteely Park on May 13th; the CNOC Summer Series starting with an urban event in Naas on May 15th, and on right through the summer. The expected 3ROC events in the Phoenix Park won’t be on this year because of restrictions on events there in August, but we expect to be running three Tuesday evening events in August at different, equally accessible locations, so watch this space! To join 3ROC or renew your membership, just see here. Remember to follow us on Facebook as well, particlularly over the summer!